After three weeks of rehabilitation and plenty of food, the hawk was ready to go back into the wild. Smithtown, NY - November 12, 2014 - On his way to work at the VA Hospital in Northport, John Ortiz came upon a hawk lying on the side of the road near the back entrance to the hospital. Having met Sweetbriar Nature Center volunteers at the hospital’s annual harvest fair, he called them for guidance. Elizabeth Santosus, Chairwoman of Sweetbriar’s Board of Trustees, came to assist. She brought the red-tailed hawk back to Sweetbriar where volunteers rehabilitated the hawk that had been malnourished and too weak to fly. After three weeks of rehabilitation and plenty of food, the hawk was ready to go back into the wild. As Suffolk County Legislator Robert Trotta represents the area where the VA hospital and Sweetbriar are located, he was invited to release the hawk into its natural habitat. Mr. Ortiz came by to say good bye to the hawk and to watch it fly onto a tree branch in the woods. 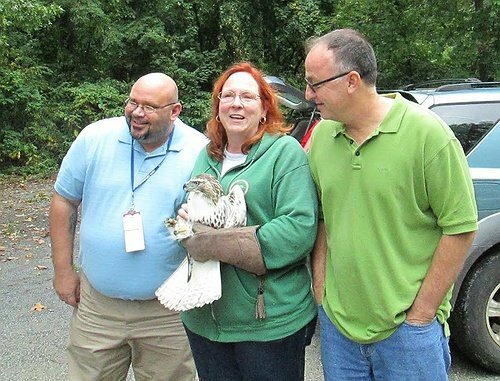 Pictured Above: Preparing to release the red-tailed hawk are from left: John Ortiz who found the emaciated hawk, Elizabeth Santosus, Chair of Sweetbriar’s Board of Trustees, and Suffolk County Legislator Robert Trotta, who had the honor of releasing the hawk. Subject: LongIsland.com - Your Name sent you Article details of "Ready, Set, Go…Suffolk County Legislator Robert Trotta and Sweetbriar Release Rehabilitated Hawk"